Everyone knows that at midnight tonight in the Eastern time zone, there will be a giant ball dropping in the middle of New York City’s Time Square. And while other cities all over the world have adopted the ball drop as a sign of the new year replacing the old, there are some towns in our fair country where a humdrum sphere simply has no place. The New Year’s Eve ball drop first went down in NYC in 1906, according to the Times Square Alliance, two years after the New York Times had just convinced the city it was cool to name the area in front of its new headquarters “Times Square” and start celebrating New Year’s there in 1904. The city banned fireworks in 1906, so the Times changed its celebratory evening to feature a 700-pound iron and wood ball getting lowered down a pole. • Beavertown, PA: Drops a beaver, of course. • A seven-foot-tall Hershey’s Kiss drops three stories in the town of Hershey, PA.
• Bethlehem, PA: A 100-pound yellow illuminated Peep made from fiberglass drops (the town is the home of the Just Born factory). • West Fairview, PA is lowering a giant, seven-foot-tall nail replica weighing 50 pounds, while elsewhere in weird Pennsylvania, yellow pants will be dropping in Lower Allen Township (home of the Yellow Breeches), a large strawberry in Harrisburg and a giant bologna in Lebanon. • Port Clinton, OH: A walleye fish named “Captain Wylie Walleye” is dropped at midnight to the delight of those watching. 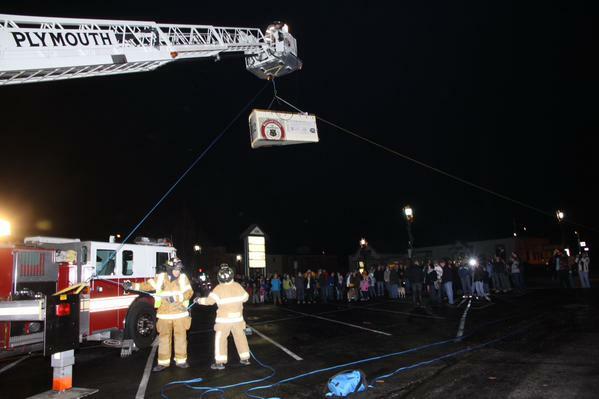 • The Big Cheese Drop in Plymouth, WI sounds fitting: 50-pound wedge of cheese is decorated festively and lowered from a fire truck ladder at midnight. • The Possum Drop in Brasstown, N.C., is in its 21st year, but this year’s event will not feature the usual live possum lowered in a ox. Instead, a toy roadkill opossum or other stand-in in will be dropped. • Eastover, N.C. drops a three-foot tall, 30-pound wooden flea. • Vincennes, IN drops an 18-foot, 500-pound steel-and-foam watermelon at midnight that will release a load of 12 locally-grown melons to a “splatform” set up below. • A muskrat wearing a top hat and bow tie named Marshall P. Muskrat gets dropped in Princess Anne, MD. • Mobile, AL drops a 600-pound lit Moon Pie. • Boise, ID drops a car-sized potato and the world expects nothing less. • The Crab Drop in Easton, M.D. features a 6-foot-wide crab sculpture lowered at midnight — also at 9 p.m. first for those who don’t want to stay up.